The government of the Republic of Guatemala has set Sunday, March 18, 2018, as the date when their referendum on the Belize-Guatemala territorial dispute will be held. The official announcement was made on Monday, October 23rd at the Tikal Futura Hotel in Guatemala City by that country’s Supreme Electoral Tribunal. It is expected that around seven million Guatemalans will vote whether the centennial territorial dispute between both countries should be taken to the International Court of Justice (ICJ). At the official event, Guatemalan president Jimmy Morales acknowledged the support from the Guatemalan Congress. The referendum will cost the country about 300 million quetzals or the equivalent of around $81 million Belize dollars. Morales also indicated why it is so important to resolve the territorial dispute between Belize and Guatemala. “The definite solution, which will provide many benefits, will overcome the many incidents along the adjacency zone, since having the certainty of a border will avoid the loss of people’s lives,” said Morales. “Our national security will be strengthened and the cooperation between the two countries will enable the fight against illicit activities and organized crime.” He concluded by stating that the health and education services shared by both countries would also improve. 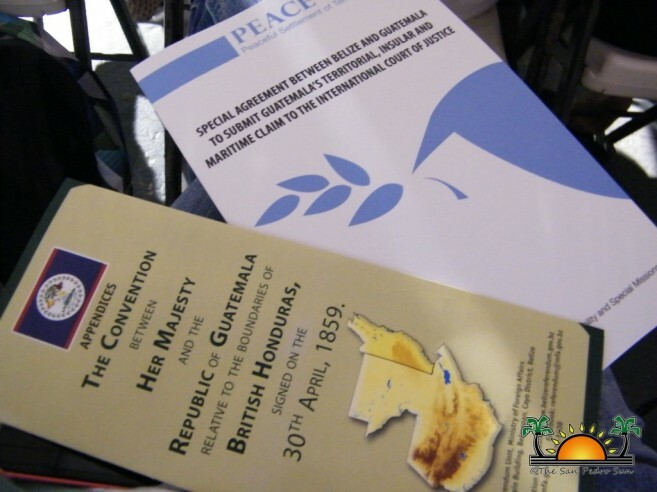 It is unknown if Belize’s Ambassador to Guatemala Alexis Rosado attended the event, however, British Ambassador to Guatemala, Thomas Carter did. According to a release by the British Embassy in Guatemala, the Government of the United Kingdom (UK) commended the decision made by Guatemala to hold the referendum in 2018. “The UK welcomes Guatemala’s plan to hold a referendum next year on referring the territorial claim with Belize to the ICJ for the decision,” said the British Ambassador. The administration of president Morales has taken a tough stance on the issue against Belize. During his presidential campaign in 2016, Morales promised the Guatemalans that he was going to fight for the reincorporation of Belize to Guatemala. Then, on another occasion, he stated that his country still has the possibility of going to the ICJ where they can fight for the entire territory or part of Belize. “I think that it is worth anything that is natural resources and of benefit to Guatemala,” he said. The Belize-Guatemala territorial dispute has been ongoing for over 150 years, and according to Guatemalans, it is all based on the 1859 boundary treaty with the UK, which claims Guatemala inherited the British occupied territory that is now Belize from Spain. They recognized the British presence, but in order to recognize English sovereignty, the UK was to build a road that would connect the territory with Guatemala City. After the boundary treaty was signed, giving Belize its present borders, the Guatemalans claim that the British did not build the road, and thus, the treaty was declared null, and Belize should be returned to them. The recent developments after Belize became an independent country in September of 1981 include the signing of a special agreement to submit the issue to the ICJ. This agreement was signed on December 8, 2008, with the requirement to hold a referendum on the matter simultaneously in Belize and Guatemala no later than October 2013. However, the date and year were later suspended in 2012, after Guatemala withdrew from the referendum arrangement. Guatemala had argued that holding the referendum was an expensive exercise, and the country did not want to commit to it because it was unsure of Belize’s commitment to the process. In May of 2015, Belize allowed Guatemala to proceed with a referendum on a different date. This was after an arrangement was made between both countries contrary to the special agreement of 2008, which stipulated that any such vote was to be done simultaneously. The referendum was then expected to be done during its second round of presidential in October 2015, but that vote was not on the ballot. Belizeans are yet to hear when the referendum will take place in Belize, as no date has been announced. However, the Government of Belize stated earlier this year that it does not intend to go to a referendum before the municipal elections, scheduled for March 2018. Despite warning from the PM, BTV’s expedition to the border is a go!